Some interviews and articles about our work, from around the world, that can provide you with beautiful new insights and deepen your understanding. An interview with Chen Lizra, in the USA, about Somatic Intelligence, the trauma she went through, why somatics are important, with lots of insights and practical practices that will impact your happiness & performance. An interview with Chen Lizra on Good Morning Lalaland in the USA, about Somatic Intelligence, the 5 elements of Somatic Intelligence method, what it brings to our lives and the magical sabrosura. Chen Lizra provides deep insights, in this new article, about the challenges that women are faced with today, a new female leadership model and how Somatic Intelligence can impact all of this. An interview with Adam Markel in the Conscious PIVOT Podcast in the USA about overcoming the fears that block our success, and overcoming them by learning through the body. An interview with Chen Lizra, and other international powerful women, in Ego magazine in Spain, part of the Hearst brand, about the power of seduction in our everyday life. An interview with Chen Lizra in Cosmopolitan UK about embracing vulnerability and owning our power. Chen Lizra’s moving personal story, in Lady Globes magazine in Israel, overcoming the trauma of her mom becoming mentally ill, when she was just 11 years old. The breakdown she went through and how she turned her life around. Be Bold magazine in India interviewed Chen Lizra about being bold, her perseverance, seduction, what she realized in Cuba, her 5 Elements of Somatic Intelligence method and much more. “Working on the premise that connecting to our inner rhythm of enjoyment is about re-teaching our body how to tune to the right channel. 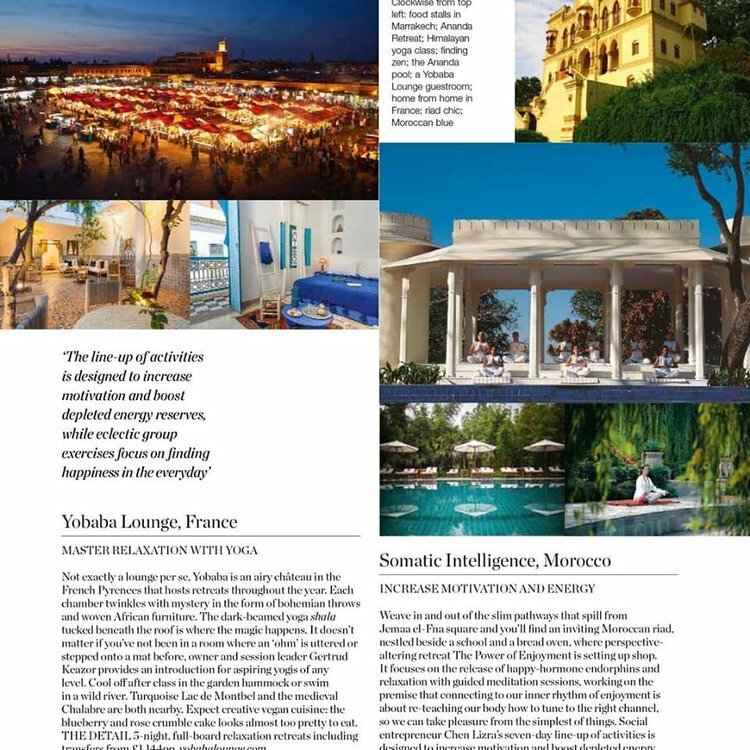 So we can take pleasure from the simplest of things.” - Somatic Intelligence in Morocco - the luxury magazine - Food & Travel - in the UK, featured the Power of Enjoyment.